Tonight’s Thursday night matchup is an interesting one for the NFC’s playoff picture. The Cowboys and Vikings appear to be going in two drastically different directions. While the Vikings started off 5-0, they now sit 6-5 and due to injuries piling up are at risk of falling out of the playoff picture in the next few weeks. The Cowboys on the other hand, have been the biggest surprise in all of football and would bring their win streak to 11 if they pulled off a road win tonight. On offense, the Cowboys discussion starts and ends with the play of rookies Dak Prescott and Ezekiel Elliott. Prescott has really grown in recent weeks as he has shown that regardless of if a game is a shootout, or one he is just asked to manage he can get the job done. Against a strong Vikings defense that should be on the field often, this week has the makings of a grind it out game. That is where Elliott comes into play. Elliott came out of Ohio State very highly touted and has lived up to the hype and then some. He has all the skills you look for in a feature back, and even as a rookie does very well in pass protection. In this matchup, he should continue to see his regular role of at least 20 to 25 touches. Even in what on paper is a tougher matchup, you need to start a player who is in consideration as the offensive player of the year in all formats. With Prescott figuring to throw the ball around thirty times, you pretty much know who the ball is going to be spread out to at this point. Dez Bryant’s chemistry with the young quarterback has grown in recent weeks and it shows in his recent performance. Even against a tough corner in Xavier Rhodes, Bryant figures to see 7 to 9 targets and should be started in all formats. Jason Witten obviously isn’t an explosive player at this point in his career, but as a safety valve we know Prescott will look his way. Figuring to see at least a handful of balls thrown his way, Witten is worth a start in fantasy formats. Cole Beasley could end up having the most productive day of the Cowboys receivers. A reliable option in the slot, Beasley has caught five or more passes in 8 of 11 games to this point. While Captain Munnerlyn was hurt, the Vikings did get burned by Anquan Boldin out of the slot last week so don’t be surprised if Beasley puts up numbers as well. Terrance Williams is still starting opposite Bryant, but the lack of balls thrown his way make him very hard to trust in fantasy formats. The Vikings have literally had everything that could go wrong injury wise happen to them on the offensive side of the ball. Somehow despite all of this, one of the last men standing is Sam Bradford who to this point in his career hasn’t exactly been the model of durability. Bradford has had his moments in his short Vikings tenure, but due to the struggling offensive line their offense has mainly consisted of check downs the past few weeks. When Bradford throws the ball, expect Stefon Diggs who is slated to play receiving the bulk of the targets. In his second year, Diggs has shown that he is a special talent and has game changing ability. He figures to see a lot of his action in the slot against Orlando Scandrick who has struggled of late. Assuming he is playing, Diggs should be a very nice option in all fantasy formats. Amongst Vikings pass catchers, none has a better matchup than Kyle Rudolph. The Cowboys have struggled against tight ends all season long, and Rudolph has the ability to make teams pay both between the twenties and in the redzone. While Adam Thielen seems to have formed a nice rapport with Bradford, Cordarrelle Patterson has the highest ceiling of the Vikings wideouts besides Diggs in this game. Patterson is a fantastic runner in the open field and has seen more snaps at receiver of late. Even if they are manufactured touches, don’t be surprised if Patterson plays a role in this one. With Peterson still a few weeks away from returning (if he does), the Vikings backfield is a mess from a fantasy perspective. All you really need to know is that even including 31 carries of Adrian Peterson, the Vikings are averaging just 2.8 yards per carry to this point. The crazy thing is, if you remove those Peterson touches the average actually rises. Jerick McKinnon has tons of physical ability, but for whatever reason hasn’t been as productive as many thought he’d be being a primary back. While he does have pass catching ability, it’s tough to suggest playing him against a stout Cowboys run defense. Matt Asiata is more of a short yardage specialist and while he does get touches, it’s unlikely they’ll pay off from a fantasy perspective unless he scores a touchdown. As a whole, I feel this game could be closely contested if the Vikings are able to find ways to stretch the field. 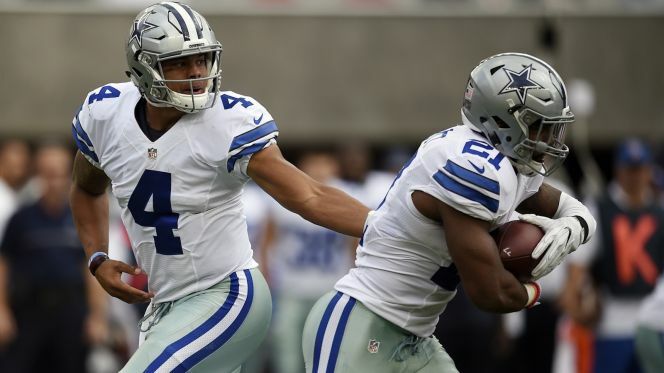 Unfortunately, the team hasn’t been able to do that and the Cowboys offensive line figures to take advantage and wear down a Vikings defense that figures to spend a lot of time on the field. My prediction is Cowboys 23 Vikings (+3.5) 16. This entry was posted in NFL, Picks against the spread, Week 13 Predictions and tagged 2016 NFL Predictions, 2016 week 13 fantasy football predictions, 2016 week 13 predictions, Adam Thielen, Captain Munnerlyn, Cole Beasley, Cordarrelle Patterson, Dak Prescott, Dallas Cowboys, Dez Bryant, Ezekiel Elliott, Jason Witten, Jerick McKinnon, Kyle Rudolph, Matt Asiata, Minnesota Vikings, NFL, Orlando Scandrick, Picks against the spread, Sam Bradford, Stefon Diggs, Terrance Williams, Xavier Rhodes. Bookmark the permalink.